Environmental factors and genetics play a big role in the development of your teeth, more so their size and shape. Unfavorable alteration in these factors generally causes your teeth to become misshapen. A few patients have misshapen teeth throughout their mouth, but the most affected teeth are upper lateral incisors, second premolars, and wisdom teeth. This is the solution for those with a few teeth, which are moderately misshapen. The procedure involves the application of a composite resin, which is customized to the color of your teeth. After its application, the material is hardened using a special light and then straightened. This way, your teeth get a natural-looking color and shape. Porcelain veneers are the perfect answer for severely misshapen teeth. These thin shells are permanently bonded to misshapen teeth. Before they are placed, your dentist might shave down your teeth slightly to enhance the fit and appearance of the veneers, making the process a minimally invasive one. Porcelain veneers replicate a natural tooth appearance since they are translucent. Invisalign are clear aligners generally used for correcting severely crooked teeth. The results when using these clear braces are evident after about half a year or two depending on the severity of your issue. 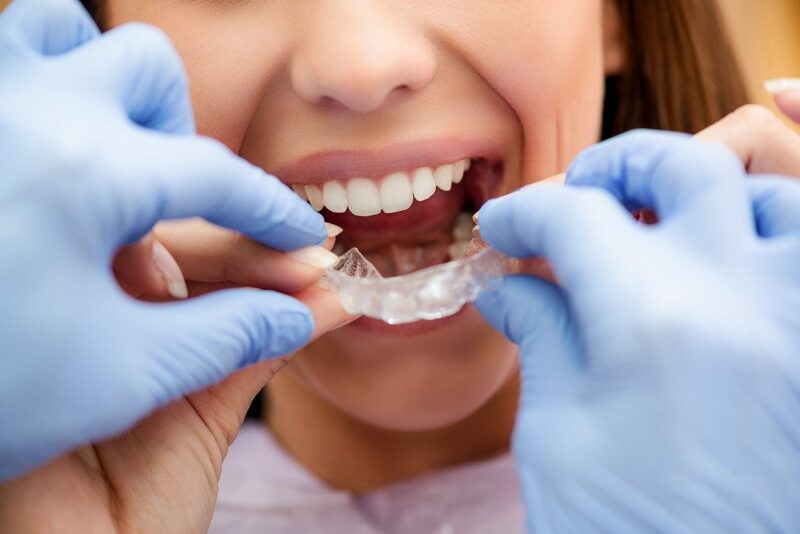 Invisalign can be easily removed for brushing, eating, and flossing, making them easy to maintain. Also referred to as a cap, a dental crown fits over and effectively replaces the entire damaged tooth on the area above the gum. This gives the tooth a better size, shape, strength, an appearance. If you have a weak tooth that is about to break or your tooth is already broken, you can use crown treatment to hold the teeth together to prevent further damage. Additionally, crowns can be cosmetically used to treat discolored or misshapen teeth. Also referred to as indirect fillings, onlays and inlays are made from porcelain, gold, or other composite materials and are used for filling damaged or decayed teeth. These dental fillings are manufactured in a dental lab and bonded to your teeth by a dentist during a visit. A filling is categorized as “onlay” when the filling covers the biting surface of the tooth or the filling touches several parts of the tooth. On the other hand, the material is referred to as an “inlay” when the filling has only been applied in the center of the tooth. Onlays and inlays preserve as much healthy tooth as they can; therefore, they are an excellent alternative to dental crowns. Cost is one of the factors that prevent most people from getting a solution for their misshapen teeth. Though they can boost your smile and overall dental health, the above treatments are generally cheap. You don’t need to worry about leaving a dent in your finances. After all, you are investing in a good dental health.